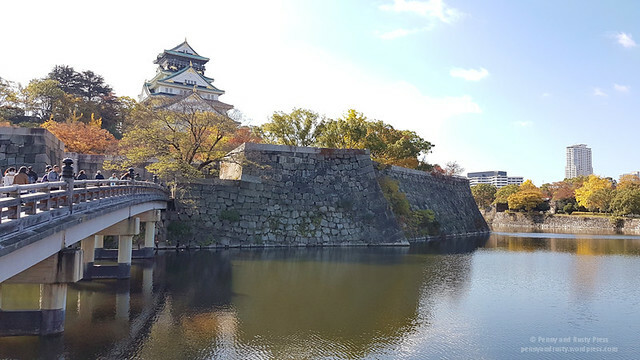 Day 1 in Osaka for us started out with a visit to Osaka Castle. 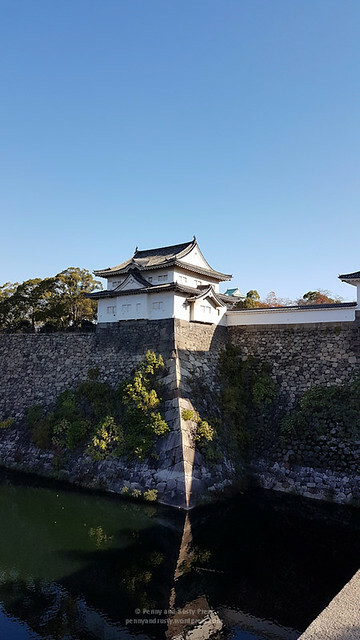 While construction of a castle at this location began in 1583 under the rule of Toyotomi Hideyoshi, the first castle was destroyed in 1615 at the end of the Toyotomi reign. 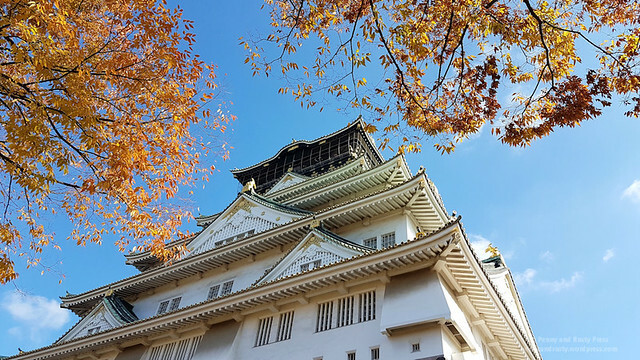 Rebuilt over the years, the current concrete reconstruction of the castle tower dates to 1931. 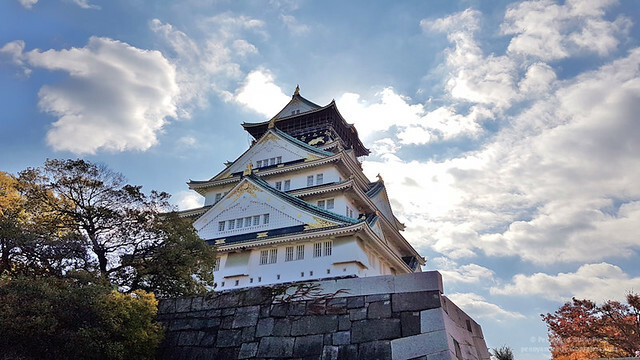 While the castle survived major bombings during WWII, major repair works were done as recently as 1997 to modernize the interior of the castle and provide a much needed face lift on the exterior. 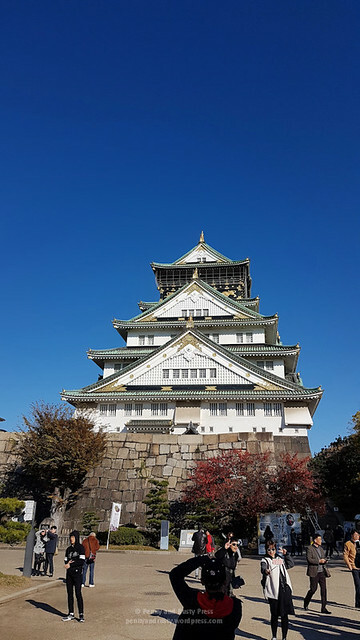 We entered the sprawling castle grounds on a beautifully sunny autumn morning from the south-east corner. 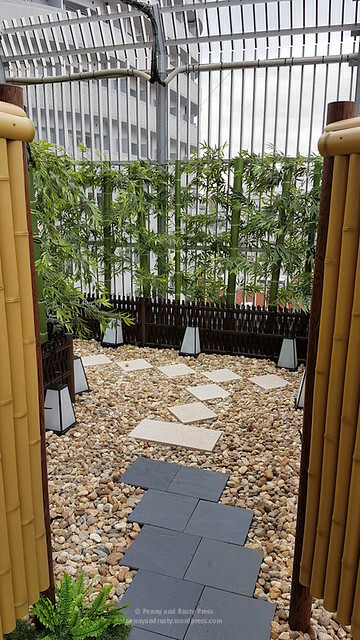 Upon approaching the secondary citadels, you can appreciate the grandeur of the large stoneworks and moat. 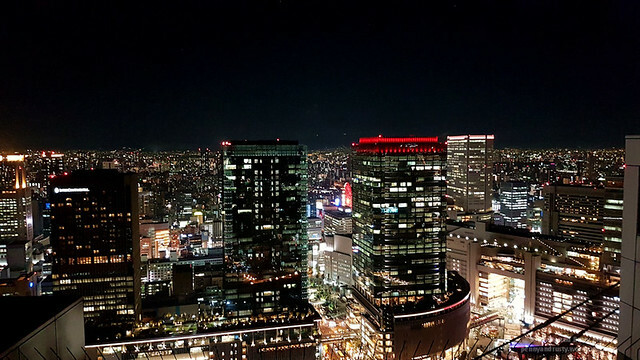 In many ways, it reminded me of the Imperial Palace in Tokyo that we saw the previous year. 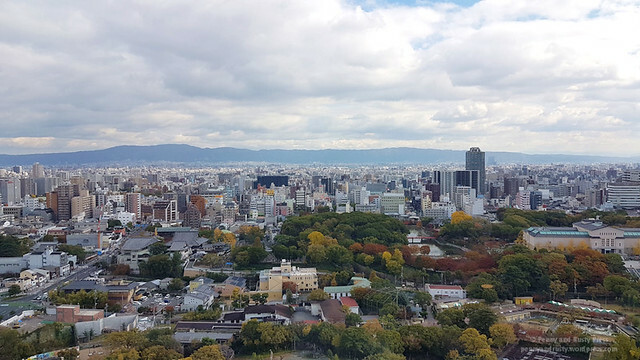 Admission to the inside of the castle is 600円 which allows you to view the museum and check out the view from the 8th floor. 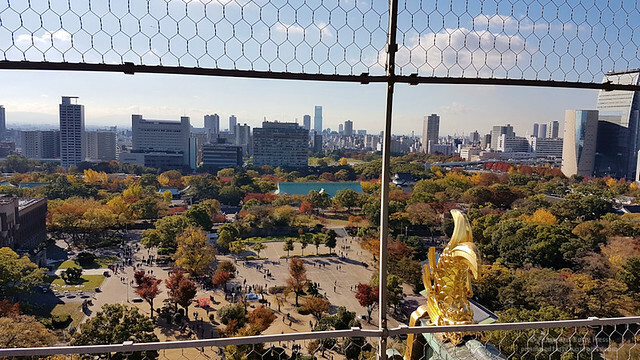 The observation platform allows you to view 360° around the castle grounds. 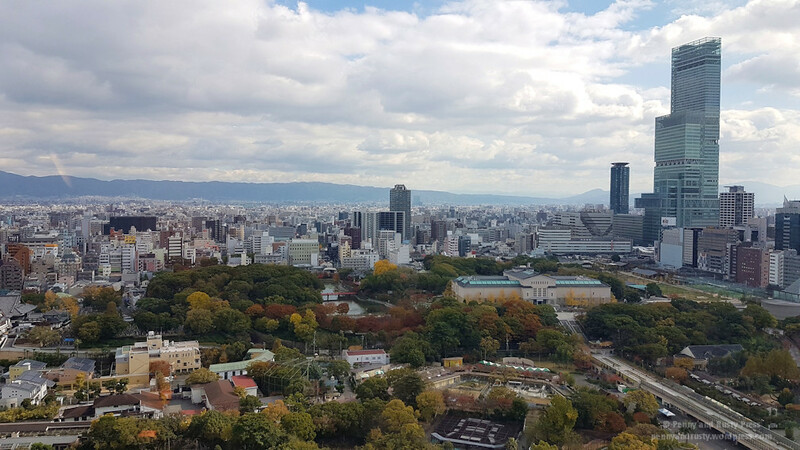 If you take the Otemon Gate entrance on the western side of the grounds, you get an impressive view of Osaka Castle. 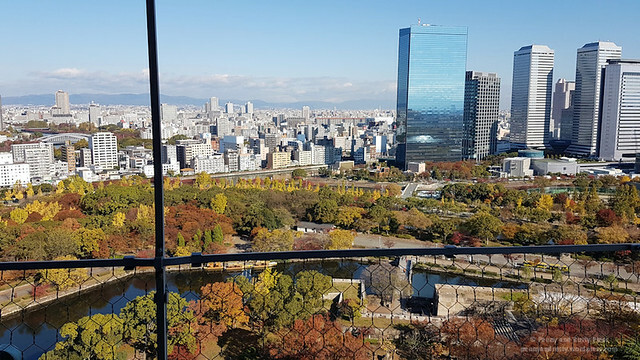 Autumn in Japan is a great time to view the autumn foliage (which you’ll see in many of our later posts). 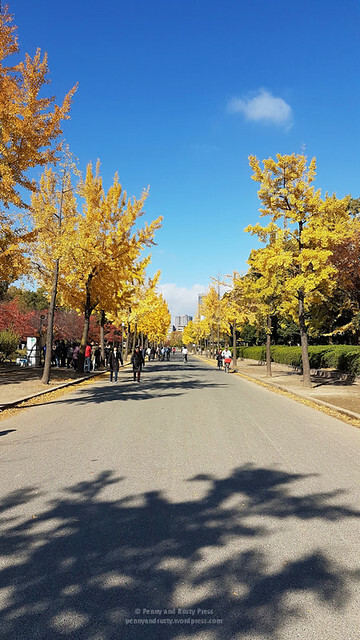 The bright yellow ginkgo trees here punctuates the clear blue skies. 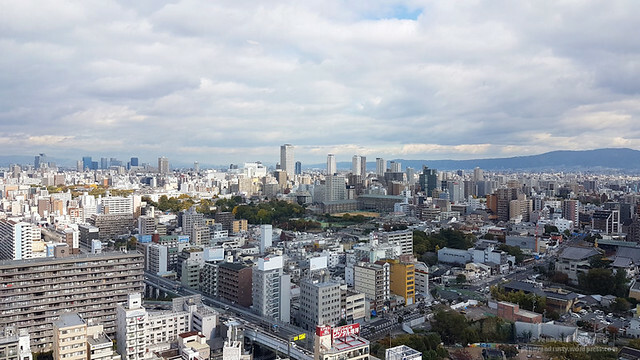 After our visit to Osaka Castle, we took the train down to the Shinsekai district – an area that was first developed around 1912 with the northern section modeled after Paris and the southern section modeled after New York. 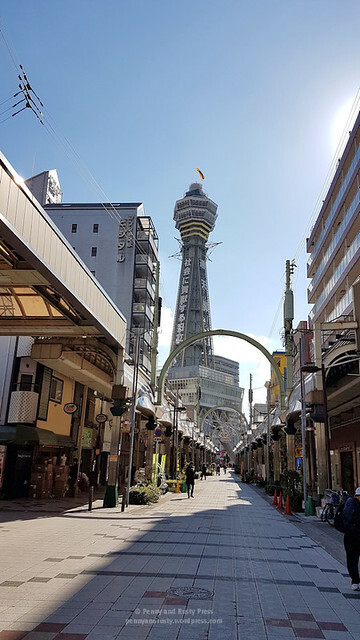 The tallest structure in the area is Tsūtenkaku Tower which is meant to resemble the Eiffel Tower and can be seen from most of the area. 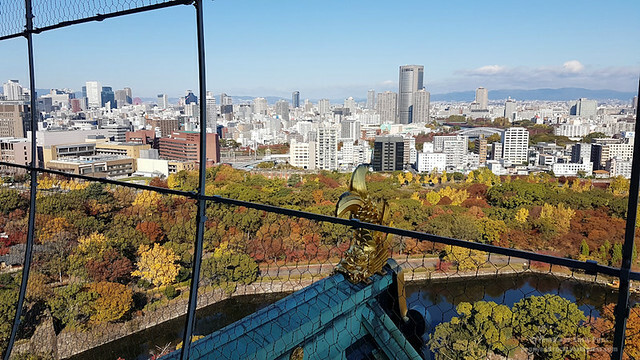 Admission to Tsūtenkaku Tower is 700円 with another 500円 for the open-air deck. 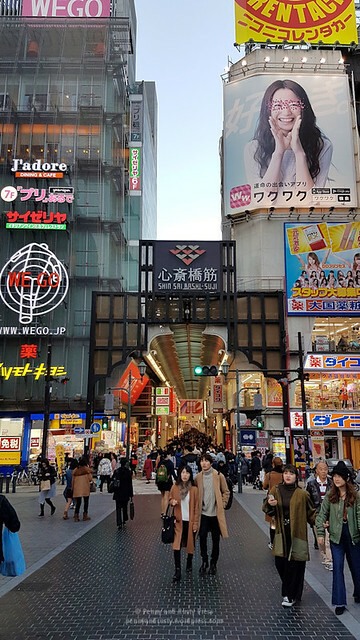 You can see nearby Abeno Harukas, the biggest department store in Japan with over 100,000 square metres of floor space, in the distance. 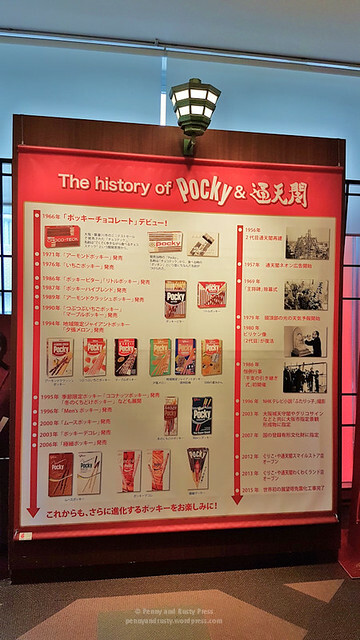 Are you a fan of Pocky? 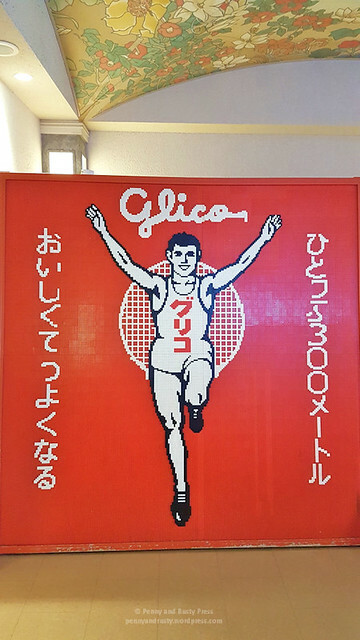 Inside Tsūtenkaku Tower is a small Glico museum where you can see the history of Pocky as well as pose next to the famous Glico Running Man. 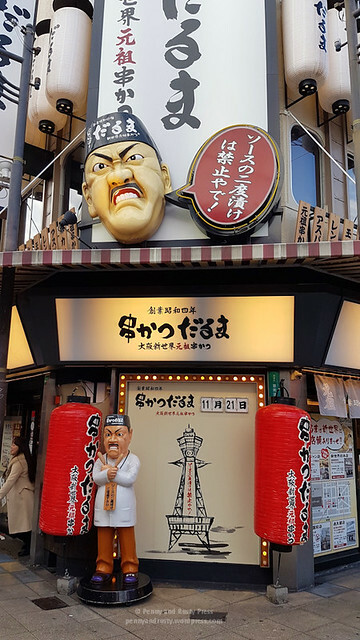 Shinsekai is known for their kushikatsu (deep-fried meats and veggies on skewers) and we wound up at Yokozuna Tsutenkaku Shop which is a kushikatsu restaurant that’s open 24 hours a day. 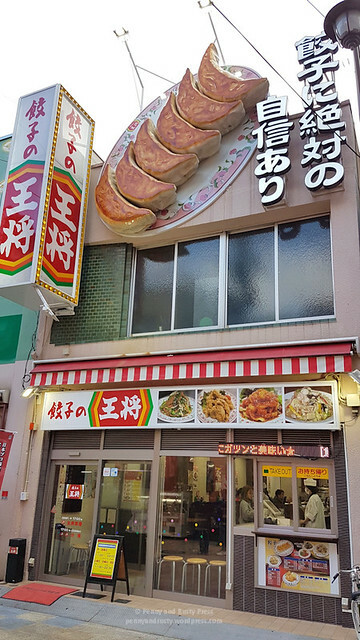 There’s a number of food stalls in Shinsekai, many of which are local chain restaurants that specialize in particular dishes such as gyoza or kushikatsu. 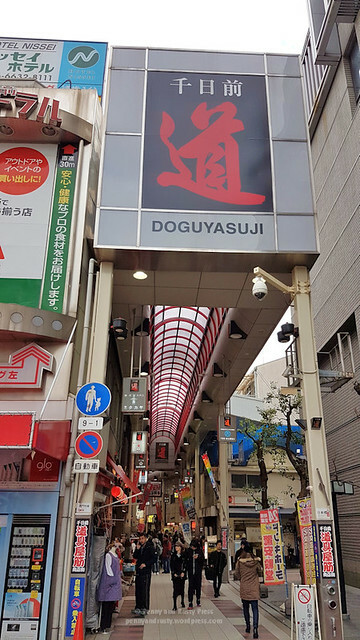 About a 20 minute walk north of Shinsekai, past Denden Town (which I personally didn’t think was as good as Akihabara in Tokyo), is Sennichimae Doguyasuji Shotengai. 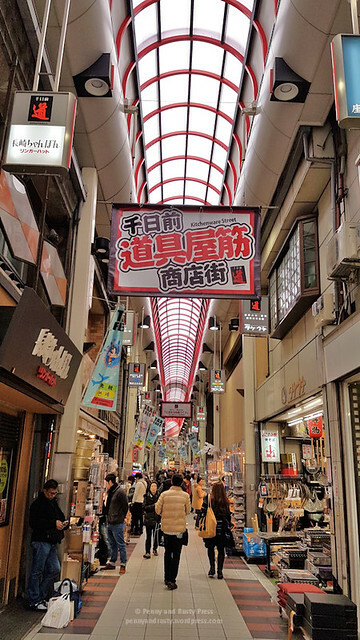 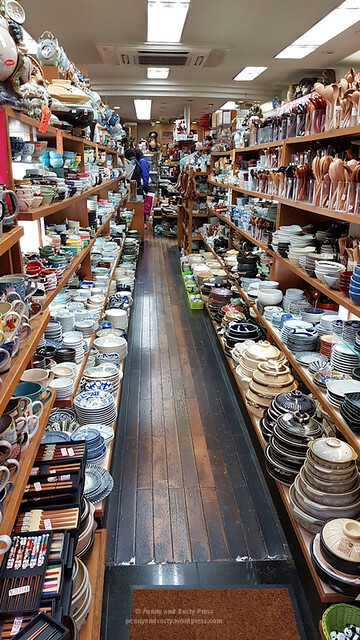 This covered shopping district is known as Kitchen Street due to all of the shops that specialize in kitchen related items. 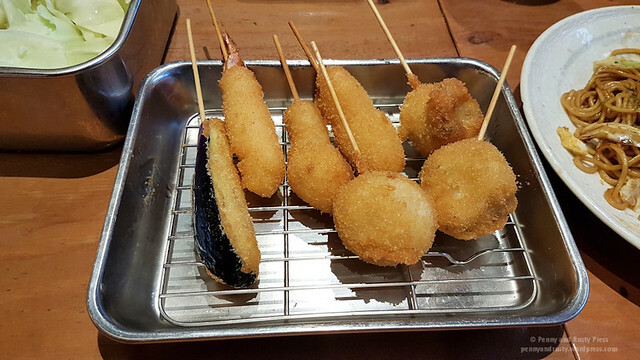 If you’re looking for a takoyaki grill, this is the place to go. 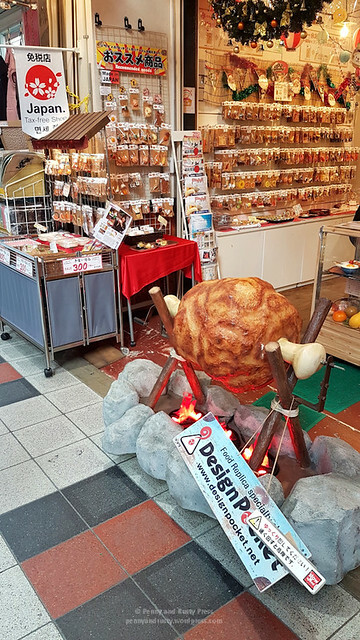 They’ve also got stores where you can buy fake, plastic food items (something which you see in many of the restaurants in Japan). 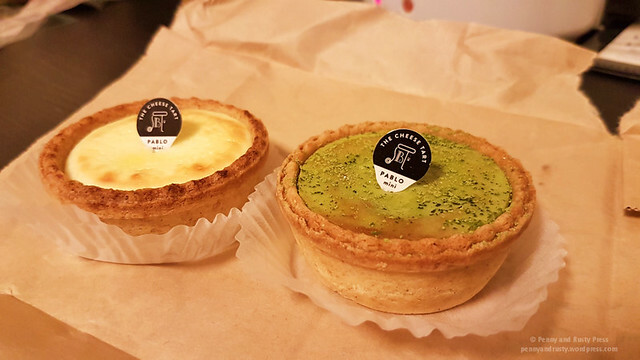 If you’ve ever had Uncle Tetsu’s then you know that Japanese cheesecake is amazing. 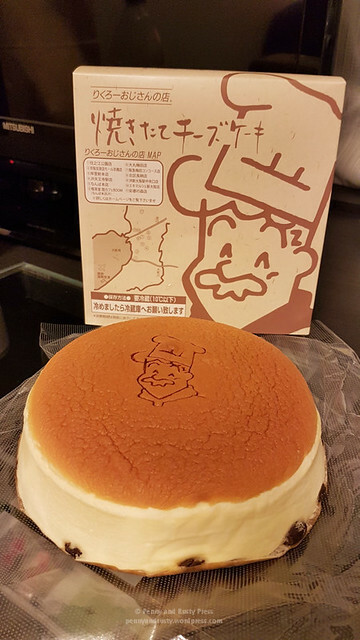 One of the well-known shops in Japan that sells Japanese cheesecake is Uncle Rikuros. 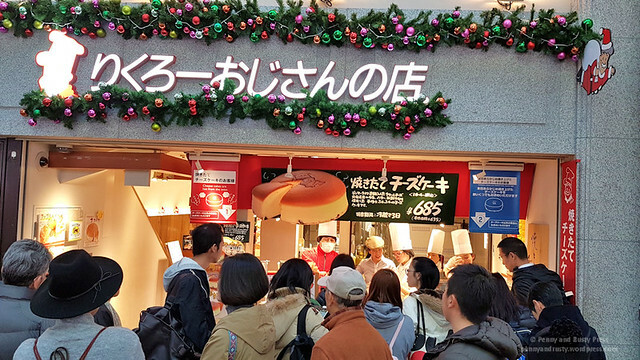 While there was a long lineup waiting for the freshly baked cheesecakes, I still feel that ones at Uncle Tetsu’s are better. 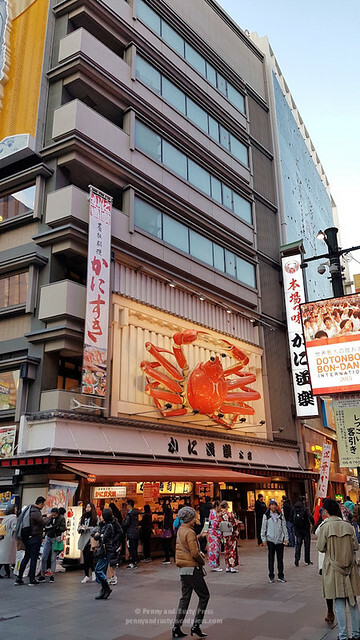 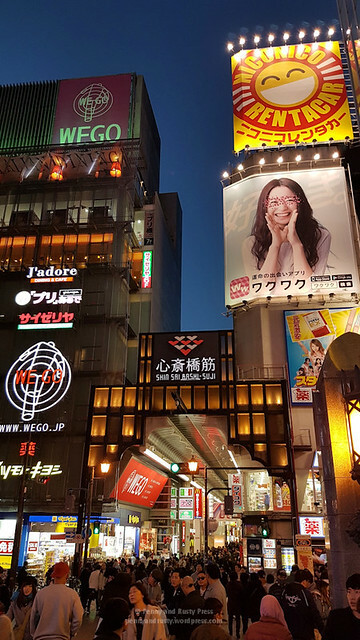 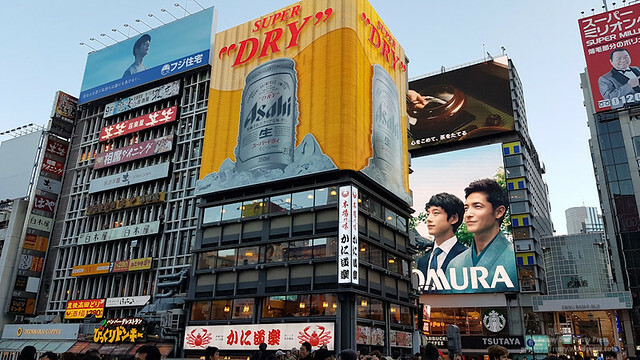 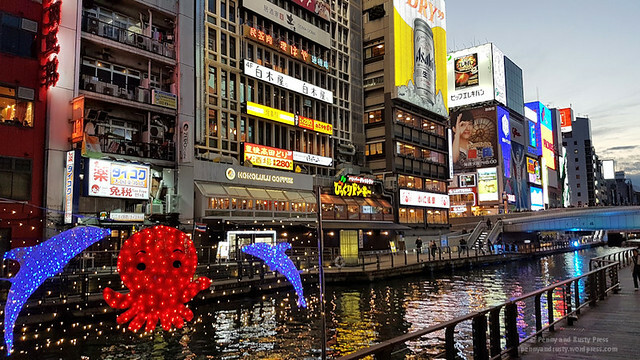 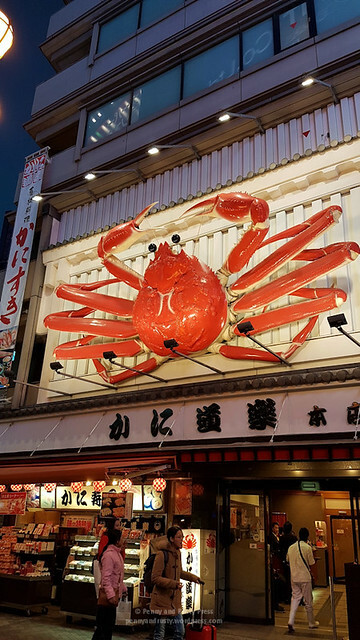 Dotonbori is one of the great food areas in Osaka and also one of the busiest tourist spot. 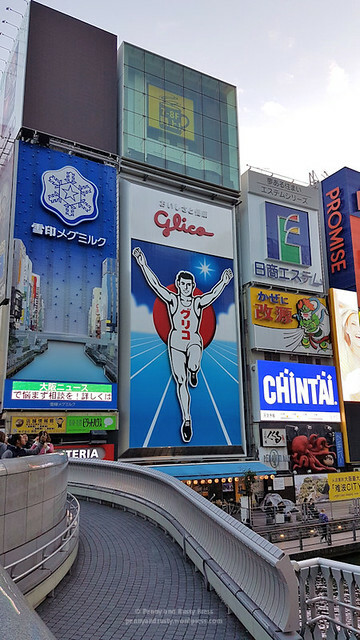 Most people come here to check out the large Glico Running Man sign that you can view from Ebisu Bridge. 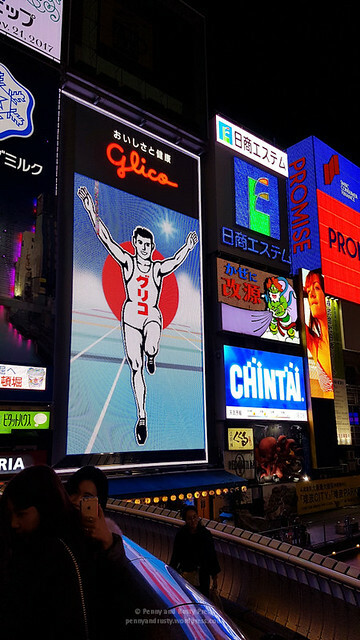 The best time to come to Dotonbori is at nighttime when all of the signs are lit up. 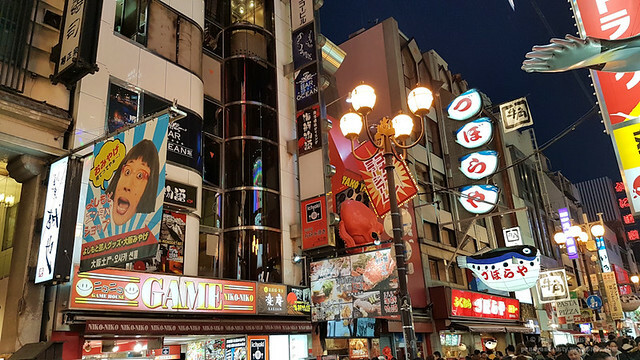 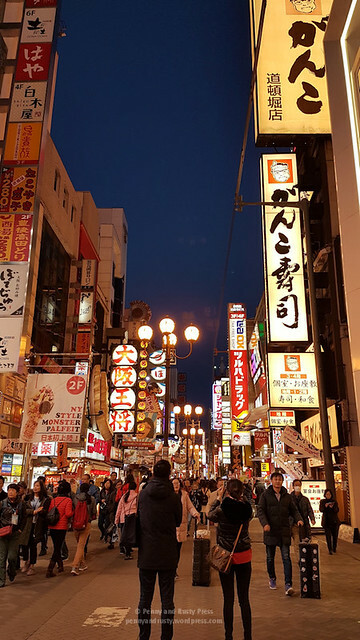 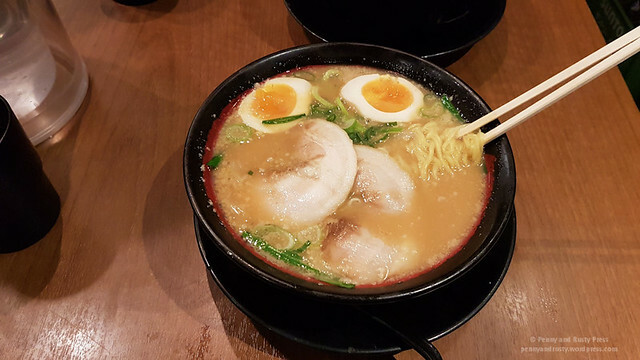 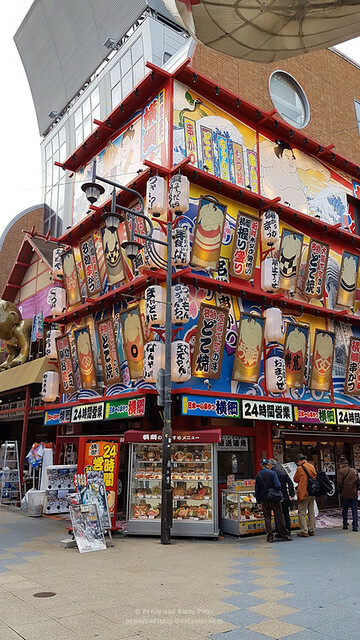 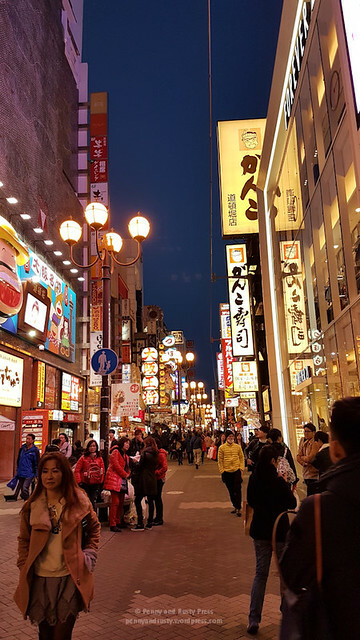 As I mentioned, there are many food options when you visit Dotonbori… everything from local street food to restaurants where you can pick up a piping hot bowl of ramen such as Ramen Shitenno. 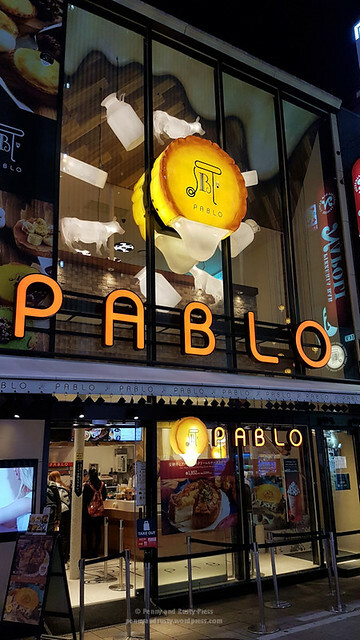 Make sure you try out Pablo Dotonbori which is a shop known for their cheese tarts. 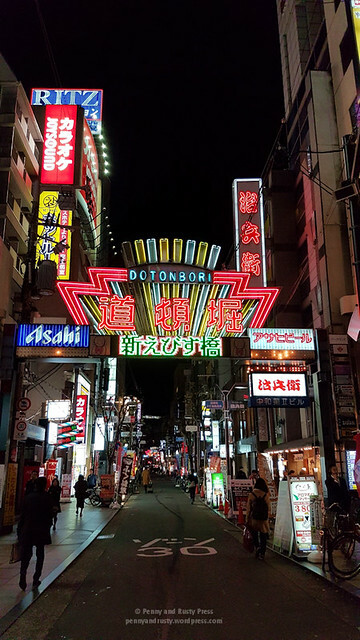 We got a bit lost trying to find our way to Umeda at night but a local woman graciously took time to show us the way (Japanese people are so nice in Japan). 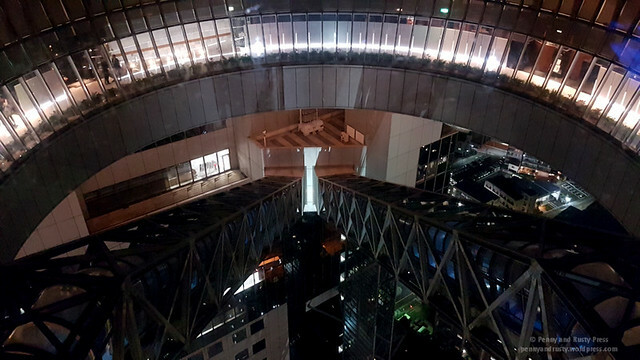 The Umeda Sky Building is known for their floating garden observatory (1000円) which you can access up an escalator that connects the two buildings. 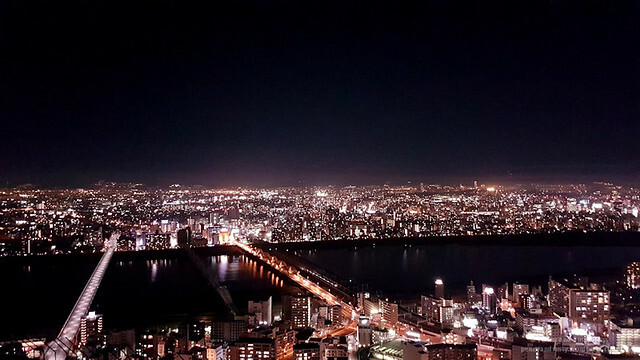 From the donut-shaped, open-air observatory, you can see an unobstructed view of the city. 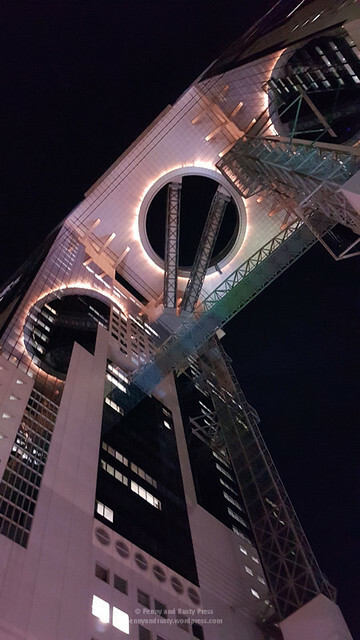 Just keep in mind that it can get pretty cold and windy up here at night. 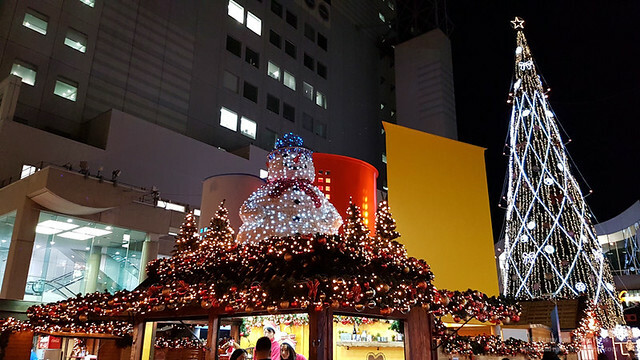 As we were in Japan in late November, Christmas Markets were popping up everywhere… including at the base of the Umeda Sky Building. 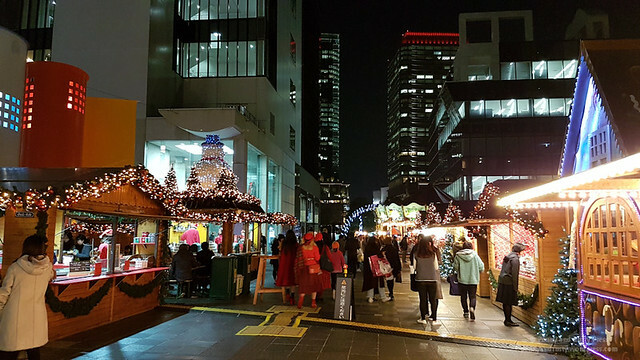 These traditional German Christmas Markets have stalls that sell xmas-related baubles as well as foodstuff. 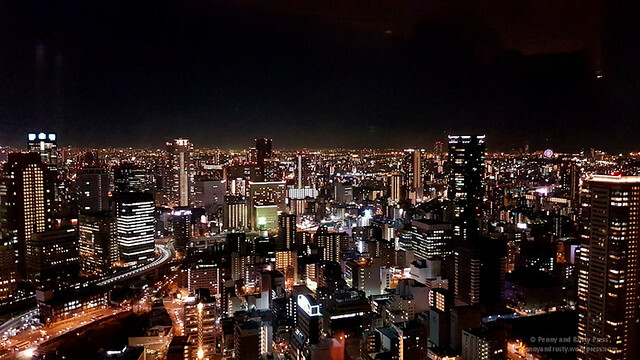 Night lights of Osaka from Umeda Sky Building. 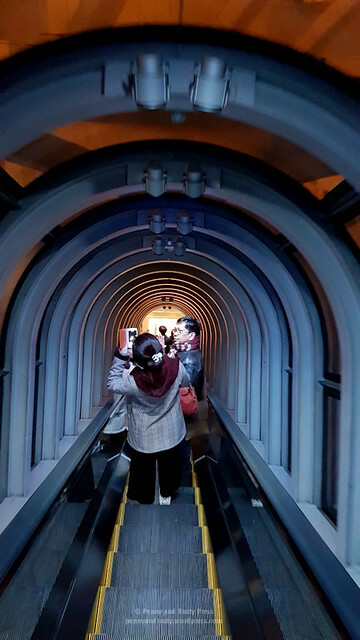 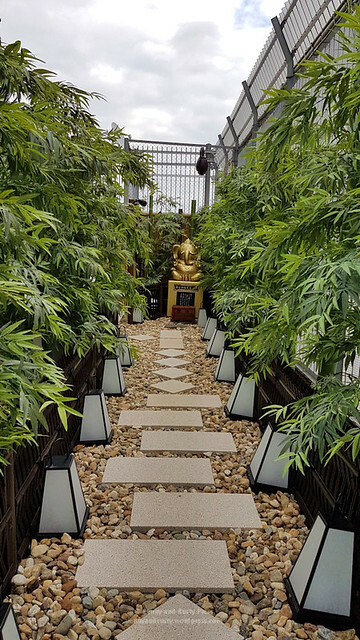 The slightly claustrophobic and acrophobia escalator that takes you to the floating garden observatory. 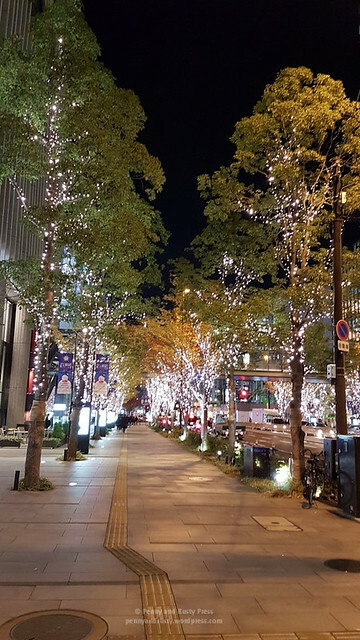 Winter Illumination is the name that they use in Japan to describe all of the pretty lights that they have to celebrate winter. 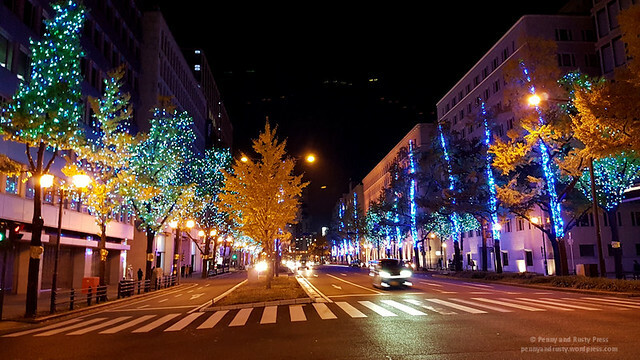 This picture is from Midosuji Dori which is one of the major north-south streets in Osaka.